Weddings are one type of an event where heartwarming traditions are mostly incorporated and infused. These wedding traditions are usually dependent on the wedding couple’s background, history and religion. Among the few wedding tradition we have discussed is about the bride wearing a white dress and something old, something new, something borrowed and something blue. 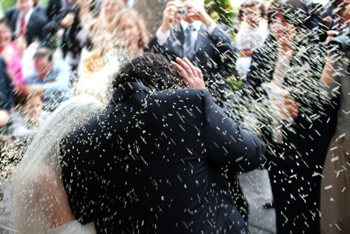 Another wedding tradition that caught our attention is the throwing of Rice. This has been a tradition being done as far as history can remember. 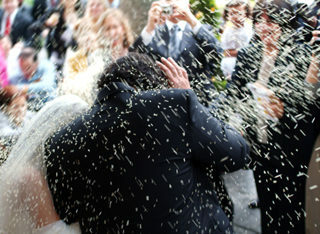 Throwing of rice at the bride and groom as they depart the wedding reception was told to be a symbol of good luck, fertility and abundance. Rice was the most common type of grain used in the wedding ceremonies but other seeds and grains has been used as well. Seeds and grains are first used because it was believed that even from the smallest of them, life and crop can grow. As beautiful as it was thrown, rice as well as other grains can be a bit hard on the face and may get slippery sometimes. Some instances, these grains may be caught on the bride and grooms eyes. So as an alternative, some preferred to throw flower petals. Rose petals are among the most thrown out on weddings. Recent times also contribute to this wedding tradition. Nowadays, we are seeing some weddings throwing bubbles at the couple instead of rice and flowers. There are also some instances that bells are rung and butterflies are released. But one thing remains true regardless of what has been done, it all symbolizes and wishes luck, joy and hope for the newlyweds.